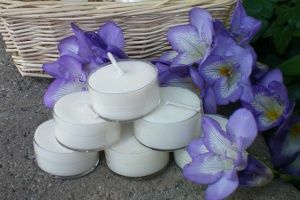 You will receive 6 unscented natural soy wax tealight candles. Handpoured fresh upon order into clear tealight cups. Our soy wax is kosher certified, non-gmo, and 100% soybean. Our tealight wicks are handmade by Irene. They are lead free cotton/paper wicks dipped in soy wax. Cruelty-free, phthalate-free, no bee or petro-chemical ingredients. Wrapped in a natural cellophane bag with a handwritten label for the name, "Unscented."